ORLANDO, Fla. – Five golf course architects walked into a conference room, and no one laughed. Well, actually there were a few laughs, but it wasn’t a joke. 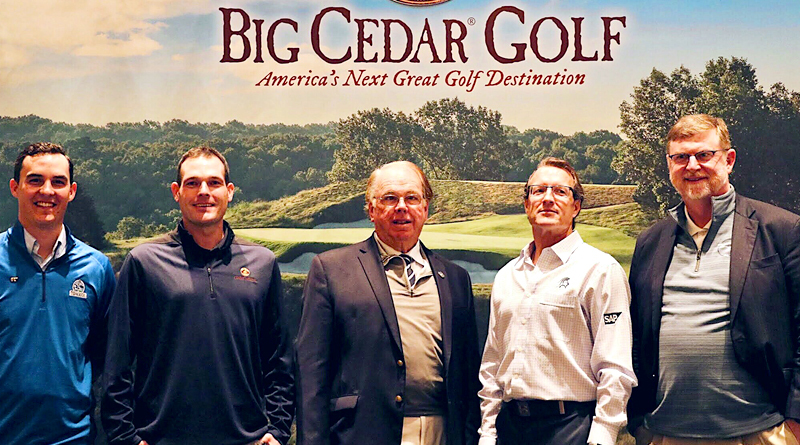 It was a Q&A press luncheon hosted by Big Cedar Golf, the increasingly mind-boggling golf destination in Branson, Missouri, at the 2019 PGA Merchandise Show in Orlando. The annual January gathering in Florida is pretty mind-boggling itself, less a show than an extravaganza, the mother of all golf shows. But it was surely an ideal time for Big Cedar to gather a flock of golf journalists together to hear from representatives from five architectural firms involved in building the courses that are turning Branson into a must-visit golf destination. Branson wasn’t doing too badly as a tourist draw to begin with, as a midwest entertainment haven, skewed toward country music acts. But when Johnny Morris, the founder and CEO of Bass Pro Shops turned his hand to golf in the Ozarks, he soon became a major player in the area’s golf and tourism scene, as owner of Big Cedar Lodge and its golfing properties, including Buffalo Ridge Springs, designed by Tom Fazio and later reworked by Fazio and Morris. Anyone who has visited and marveled at the vistas near the Top of the Rock course, one hub of the seemingly ever-growing resort, would be inclined to agree, as all members of the panel did. Aside from Fazio, the Murderer’s Row of architectural reps at the luncheon included Jeff Lawrence, senior designer at the Gary Player Design Group; Keith Rhebb, a design associate for Coore & Crenshaw; Beau Welling, a senior design consultant for TGR Design by Tiger Woods, and Tommy Hearden of Nicklaus Design (Hearden more a business development specialist than a designer). All of the firms have a major hand in at Big Cedar, and spoke to some of the challenges and opportunities the work there afforded them. Nicklaus Design is responsible for the Top of the Rock Course, which is the first par-3 track to be part of a professional championship, the Bass Pro Shops Legends of Golf on the Champions Tour (April 26-28 this year). Though originally opened in 1996, the course was reborn in 2014 with views of Table Rock Lake and the Ozark Mountains alongside an Arnold Palmer-designed and partially synthetic practice area, a Tom Watson-designed practice green modeled after the Himalayas putting course in St. Andrews (which later collapsed into a cavern which will eventually be a tourist attraction itself) a chapel, a Civil War era cabin and Arnie’s Barn overlooking it all. Both the pro shop and a cavernous restaurant, the building is reconstructed from the timbers of a 150-year-old barn dismantled not far from Palmer’s home in Latrobe, Pennsylvania. Twenty years ago Tiger Woods went fishing with Morris, a day that appears to have been a highlight for both men. Now the two are collaborating on the first public course from TGR Design, Payne’s Valley. Scheduled to open this fall, the track will also be a tribute course to the late major champion, Payne Stewart.